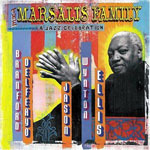 Content by tag "The Marsalis Family"
The Marsalis family--father Ellis on piano with sons Branford on tenor and soprano saxophones, Wynton on trumpet, Delfeayo on trombone, and Jason on drums--has put an indelible stamp on the world of jazz. One problem: they've never played together as a family. The First Family of Modern Jazz performed on August 4, 2001 at a concert hall in The Crescent City to mark the retirement of Ellis Marsalis from teaching duties at the University of New Orleans. Fortunately, the event was captured on tape.